Ti amo is an enchanting display of romantic blossoms. This is an extremely passionate romantic bouquet designed especially for Valentines. 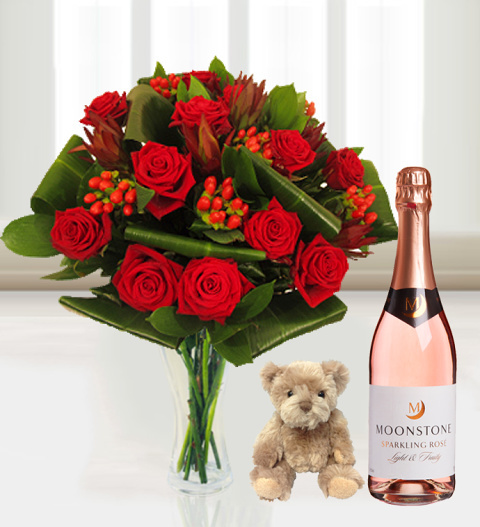 The bouquet boasts a superb selection of long stemmed red roses expertly arranged with hypericum berries at in a bed of folded aspidistra leaves. Also included is a cute cuddly bear and a delicious 75cl bottle of sparkling wine. The arrangement also comes with a FREE box of Belgian chocolates. Chocolates may contain nuts.